Visual templates in auto mode allow you to adjust two levels of hierarchy. Template Properties are applied to the entire template, Field Properties are applied to individual fields within the template. When you create a template the template properties and field properties are setup automatically based on the context of the creation. You adjust these properties through the visual controls to tune the template to your exact data extraction objectives. The field properties are adjustable for each field in each template. First select the template tab that you wish to work on, then select the specific field in the input dictionary as shown below. Give your field any name. The name or index number can be used when referring to the field. The name does not effect the data extraction. Set the type as String, Alphanumeric, Word, Numeric, Data, or Mask. Any records that do not conform to the selected type will not be included in the template and, unless those items are included in another template, they will not be extracted. 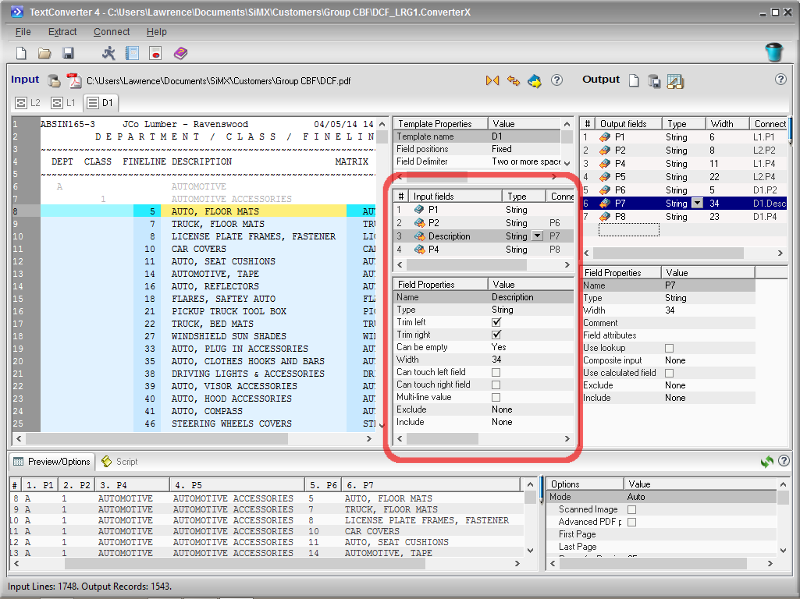 Only items conforming to the selected type will be considered records for the purposes of the selected template. If these options are checked, any extra spaces to the left or right of the value will not be extracted. Only the actual value will be extracted. Spaces within the value will still be included. Options for "Can be empty" are Yes, No, or Must be (empty). Any records not conforming to the selection will be excluded from the template. By default, there must be at least one space between adjoining fields. For cases of positional input where adjoining fields can touch without any intervening spaces, select these options to allow this. The value may extend over multiple lines. If this option is selected you will need to define a Bottom boundary so that the software will will know when to stop collecting data for the field. A Line Separator can also be defined as required. Additional arbitrary regular expression criteria can be applied to include or exclude records from the template that have certain characteristics.